Loren J. Bartels, M.D., FACS is an Otologist, Neurotologist, and Skull Based Surgeon in Tampa, FL. Loren J Bartels MD FACS was a member of the charter class of the University of South Florida College of Medicine, which graduated in 1974. He was elected a charter member of the USF chapter of the Alpha Omega Alpha Medical Honor Society, a national organization of outstanding medical school students. Dr. Bartels completed post-graduate residency training in otolaryngology (head-and-neck) surgery at the Geisinger Medical Center, Danville, PA. He is Board Certified by the American Board of Otolaryngology. He completed a one-year fellowship in otology, neurotology and skull-base surgery in 1980 at the world-renowned House Ear Institute in Los Angeles. 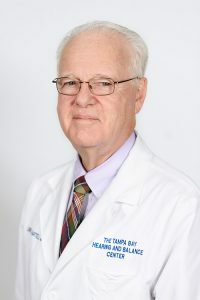 Dr. Bartels returned to USF in 1980 and joined the faculty of the College of Medicine where he rose to the rank of associate professor with tenure in Surgery, Neurology and Radiology. While in private practice, he has been promoted to Clinical Professor of Otolaryngology. At USF, he and his chief audiologist opened Tampa Bay area’s first cochlear implant program as well as the first cochlear implant program in the State of Florida dedicated to meeting the needs of children. The staff of the Tampa Bay Hearing and Balance Center continue this work with the busiest cochlear implant services in our region. Dr. Bartels has served as an officer of several organizations, including president of the USF College of Canadian Pharmacy Medicine faculty and the Florida Society of Otolaryngology. He has been Chief of the Medical Staff for Tampa General Hospital and a member of the Tampa General Hospital Board of Directors. He has been recognized in Best Doctors in America continuously since 1992 and has been elected as a member of several prestigious senior professional societies, including the American Otologic Society, the Triologic Society, the American Neurotology Society and others. He received the Honor Award from the American Academy of Otolaryngology-Head and Neck Surgery for service on the task forces which wrote the Board Certification examination questions and created home study courses in otolaryngology. He received the Distinguished Alumnus and the Alumni Service Award from the USF College of Medicine Alumni Association. He worked with State of Florida Children’s Medical Services staff and others to establish a law that mandates that all newborn babies have their hearing checked. Dr. Bartels has written and made scholarly presentations on a variety of ear-related problems. With Advanced Bionics Corporation, a cochlear implant company, training video CDs of Dr. Bartels’ cochlear implant surgical techniques have been produced that are now used in many countries to train other surgeons in modern cochlear implant surgical methods. Dr. Bartels and the staff of the Tampa Bay Hearing and Balance Center are delighted to welcome you to our offices and we appreciate the privilege of serving you. Selected by The Best Doctors in America to reevaluate The Best Doctors in America database for 2003-2004. Assistant Professor of Surgery, Division of Otolaryngology, University of South Florida, College of Medicine, Tampa, Florida, July 1980 to July 1987. Associate Professor of Surgery, Division of Otolaryngology, University of South Florida, College of Medicine, Tampa, Florida, July 1987 to May 1995. Clinical Associate Professor of Surgery, Division of Otolaryngology, University of South Florida, College of Medicine, Tampa, Florida, June 1995 to present. Assistant Professor of Neurotology, University of South Florida, College of Medicine, Tampa, Florida, August 1983 to August 1987. Associate Professor of Neurotology, University of South Florida, College of Medicine, Tampa, Florida, August 1987 to June, 1995. Clinical Associate Professor of Neurotology, University of South Florida, College of Medicine, Tampa, Florida, July, 1995 to present. Associate Professor of Radiology, University of South Florida, College of Medicine, Tampa, Florida, August 1987 to April 1995. Clinical Associate Professor of Radiology, University of South Florida, College of Medicine, Tampa, Florida, May 1995 to present. Clinical Professor of Department of Otolaryngology, University of South Florida, College of Medicine, Tampa, Florida, August 2001 to present. Attending Physician, James A. Haley Veterans Hospital, Tampa, Florida, July 1980 to March, 1995. Attending Physician, Otolaryngology-Maxillofacial Surgery, Tampa General Hospital, Tampa, Florida, July 1980 to present. Section Secretary 1981-1990; Section Vice Chief 1990-1991; Department Chief 1994-1996. Attending Physician, University Community Hospital, Tampa, Florida, March 1982 to September, 1987; and April 1995 to present. Consulting Physician, University Community Hospital, Tampa, Florida, January 1989 to 1992. Consulting Physician, St. Joseph’s Hospital, Tampa, Florida, July 1983 to 1992 and August, 1995 to present. Courtesy Privileges, All Children’s Hospital, St. Petersburg, Florida, 1988 to 1992. Pediatric Otolaryngologist, State of Florida Children’s Medical Service, Tampa Bay Area, Florida, January, 2006 to December 30, 2008. Vice Chief of Staff, Tampa General Hospital: 1998 to 2000. Chief of Staff, Tampa General Hospital: 2000 to 2002. Member, Bylaws Committee, Tampa General Hospital: 2005-2007. Hearing Subcommittee, American Academy of Otolaryngology – Head & Neck Surgery, Inc., August, 1996 to 1999. Constitution and ByLaws Committee, The American Neurotology Society, July, 1999 – July, 2004. Second US/UK Joint Otolaryngology Meeting, Panel Topic: Medical and Surgical Treatment of Meniere’s Disease, Boston, Massachusetts, July, 1997. Morton Plant Health Ventures, Inc. and St. Petersburg Junior College. Seminar: “Vestibular Rehabilitation.” Topic: “Role of Surgery in Management of Vestibular Disorders,” St. Petersburg, Florida, October, 1997. Florida Society of Otolaryngology. Jeffrey West MD and Loren J. Bartels, MD Topic: Autoimmune Inner Ear Disease – Plaquenil, Miami, Florida, November, 1999. House Ear Institute. Guest Instructor: Temporal Bone Surgical Dissection Course. Los Angeles, California. June 10-14, 2000. Facial Nerve Study Group Meeting – 2001 Annual Meeting of Otolaryngology – Head & Neck Surgery Topic: “Facial Nerve Paralysis Secondary to Fungal Mastoiditis” – Denver, Colorado, September 10, 2001. Facial Nerve Study Group Meeting – 2003 Annual Meeting of Otolaryngology – Head & Neck Surgery; Topic: “Parry Romberg Syndrome” – Orlando, Florida, September 22, 2003. Children’s Tumor Foundation: Florida Chapter Annual Meeting – Topic: “Neurofibromatosis Type 2 (NF2): Clinical Aspects and Acoustic Neuroma/Hearing Treatment Options – Shriners Hospital, Tampa, Florida, October 8, 2005. University of South Florida, College of Medicine, Department of Neurology, Tampa, Florida. Topic: “Vestibular Disorders and Physical Therapy,” February, 1996. Annual Meeting of the Florida Chapter of the National Neurofibromatosis Foundation, St. Petersburg, Florida. Topic: “Neurofibromatosis,” October, 1996. University of South Florida, College of Medicine, Division of Neurological Surgery and Rehabilitation, Tampa, Florida. Topic: “Audiology Basic Sciences,” February 4, 1997. University of South Florida, College of Medicine, Division of Neurological Surgery and Rehabilitation, Tampa, Florida. Topic: “Acoustic Neuroma – Diagnosis & Management,” February 11, 1997. University of South Florida, College of Medicine, Department of Surgery, Temporal Bone Course, Tampa, Florida. Topic: “Bell’s Palsy,” March, 1997. University of South Florida, College of Medicine, Department of Neurology, Tampa, Florida. Topic: “Acoustic Neuromas – Approach and Treatment,” March, 1997. University of South Florida, College of Medicine, Department of Radiology, Tampa, Florida. Topic: “Otosclerosis,” May, 1997. University of South Florida, College of Medicine, Continuing Medical Education Activity, Tampa, Florida. Seminar: “Syncope, Vertigo and Imbalance.” Topic: “Vertigo, Imbalance & Lightheadedness: The Difference,” September, 1997. University of South Florida, College of Medicine, Department of Internal Medicine, Division of Allergy and Immunology, Guest Lecture Series, Tampa, Florida. Topic: Autoimmune Inner Ear Disease,” December, 1997. Annual Meeting of American Academy of Otolaryngology-Head & Neck Surgery, Facial Nerve Study Group Meeting. Topic: “Facial Nerve Paralysis Secondary to Fungal Mastoiditis,” Denver, Colorado, September, 2001. University of South Florida, College of Medicine, Neurosurgery Grand Rounds, Topic: Acoustic Neuroma, Tampa, Florida, November 16, 2001. Course Director,Tampa General Hospital Medical Staff Meeting and CME Courses, Tampa, Florida, September 18, 2002. CME Lecture at St. Petersburg General Hospital , Topic: Vertigo, St. Petersburg, Florida, November 20, 2002. Preceptor for University of South Florida College Of Medicine, Longitudinal Clinical Experience (LCE) Program, November, 2002 through May, 2003. Lecture and Prosection, USF Microsurgery Lab Master Course, Topic: Expanded Translabyrinthine Approach to Acoustic Neuroma, January 26, 2003. University of South Florida, College of Medicine, Pediatric Grand Rounds, Tampa, Florida, Guest Lecturer, Topic: “Genetic Hearing Loss,” January 20, 2005. Tampa General Hospital White Coat Mini-Internship Program, Tampa, Florida, February, 2000. Tampa General Hospital White Coat Mini-Internship Program, Tampa, Florida, February, 2001. Southern Deaf Showcase. Cochlear Implants. Clearwater, Florida, September, 2001. Tampa General Hospital White Coat Mini-Internship Program, Tampa, Florida, June, 2001. Tampa General Hospital White Coat Program, Tampa, Florida, February, 2002. Tampa General Hospital White Coat Program, Tampa, Florida, June, 2002. Tampa General Hospital White Coat Program, Tampa, Florida, September, 2002. Tampa General Hospital White Coat Program, Tampa, Florida, February, 2003. SHHH (Self Help for Hard of Hearing People), Sarasota, Florida Topic: “Cochlear Implants.” February, 2004. Sertoma Club, Keynote Speaker at Installation Banquet, Topic: Cochlear Implants; Rusty Pelican, Tampa, Florida, June 25, 2005. Bartels, L.J., Dennis, S.H., Metrizamide Ototoxicity Brief abstract: Four patients with suffered sensorineural hearing loss after metrizamide myelography. The mechanism of toxicity and prevention are discussed. Bartels, L.J., Dennis, S.H., Silastic Ototoxicity Brief abstract: Two patients with silastic associated hearing loss are presented with presumed reasons. Bartels, L.J., Dennis, S.H., Alcohol Ototoxicity Brief abstract: Three patients with aural irrigation induced sensorineural hearing loss are presented to note the potential ototoxicity of this commonly used aural irrigant. Bartels, L.J., CT Directed Needle Aspiration of the Skull Base, Extension of a Diagnostic Tool. Bartels, L.J., Letters to the Editor. Transactions – Pennsylvania Academy of Ophthalmology & Otolaryngology, “Cervicofacial actinomycosis: a variable disorder,” Vol. 32(1), p. 62-6, Spring 1979. Bartels, L.J., Letters to the Editor. “Persistent total facial paralysis five months after mastoid surgery,” The American Journal of Otology, Vol, 5(5), p. 421-2, July, 1984. Bartels, L.J., Facial Nerve and Medially Invasive Petrous Bone Cholesteatomas, Annals of Otology, Rhinology & Laryngology, Vol. 100, No. 4, pp. 308-316, April, 1991. Bartels, L.J., Letters to the Editor. “Management of facial spasm following traumatic facial palsy,” The American Journal of Otology, Vol. 12(3), p. 236, May, 1991. Bartels, L. J., Letters to the Editor. “Hearing threshold differences and risk of acoustic tumor,” Otolaryngology – Head and Neck Surgery, Vol. 107(3), p. 494-5, September, 1992. Reviewer for Otolaryngology – Head and Neck Surgery, Manuscript No. 97284. Reviewer for Otolaryngology – Head and Neck Surgery, Manuscript No. 97431. Reviewer for The American Journal of Otology, Manuscript No. 98-117. Meigs, Matthew, Bartels, Loren J.: Cystic Hygroma of the Auricle, External Auditory Canal, and Mastoid, Southern Section Meeting, American Laryngological, Thinological and Otological Society, The Triological Society, Miami, Florida, January 13-15, 2005. 3M-Vienna Cochlear Implant for profoundly Hearing Impaired Adults. Status: Two patients accrued. Study completed. Data added to national center data. Clarion – MiniMed Clinical Trials for Adult Cochlear Implants, 1992 to June, 1996. Patients accrued: 4. Clarion – MiniMed Clinical Trials for Children Cochlear Implants, 1994-1997. Bartels, L.J. : 3M-Vienna Cochlear Implant Project at USF-TGH, a multicenter project. (a) Funding: Tampa General Hospital for equipment and implant: $30,000.00, (b) Funding: USF, Department of Surgery for Speech Pathology: $15,000.00; (c) Status: Two patients implanted and others evaluated, but not accepted for the project. The project is completed and data have been submitted to the national data base. The second patient is now able to use the telephone, a remarkable accomplishment. Bartels, L.J. : Surgical Dissection Microscopes: $25,000.00, 1987; $10,000.00, 1988 and $13,000.00, 1989, for use in the annual temporal bone course. Nine microscopes have been obtained for use with our residents and for use with the medical students for teaching purposes. MimiMed Clarion Adult cochlear Implant Program: approximately $25,000.00 of equipment. Fellowship Grant from Advanced Bionics to The Tampa Bay Hearing & Balance Center: $15,000.00 to train new cochlear implant audiologist; May, 2003. Vestibular Diagnostic and Rehabilitation Center is in planning phases for feasibility at USF vs. TGH and space needs. Neurotology Services: 1980 Dr. Bartels was the first otologist in the Tampa/St. Petersburg area to set up an organized team of otologist-neurosurgeon for acoustic neuroma, vestibular nerve section, and other skull base lesions that bridge the temporal bone and adjacent intracranial cavities. The only other teams that existed in Florida, at the time of Dr. Bartels’ arrival, were at the University of Miami and in Sarasota. Audiology: 1981-1982 Audiology service, at Dr. Bartels’ arrival, consisted of a small 4 foot by 4 foot booth, an old audiometry machine and old tympanogram machine. Converted to a three-room suite designed by L.J. Bartels, M.D. and H. Pomerantz, M.S., CCC-A. The suite consisted of the original booth as well as an 8 foot by 8 foot booth. In addition, other services were added as below. Auditory Evoked Potentials: 1981-1982 The first Auditory Brainstem Responses equipment for auditory and visual system evaluation was added to the USF Medical Clinics. Dr. Bartels trained Lisa Fernandez, M.S., CCC-A, Harris Pomerantz, M.S., CCC-A, and a number of others in this diagnostic modality. Dr. Bartels instituted an Auditory Evoked Potentials Club to encourage others in the community to begin to use this modality. It was only sporadically used, occasionally available service in the community, at the time. Dr. Bartels is responsible for this service being available in the operating room at the Tampa General Hospital as a monitoring tool. Otoacoustic Emissions: 9/1995 Added service at The Tampa Bay Hearing & Balance Center provides rapid screening of cochlear function in infants, children and young adults. The program begins with new equipment and enhanced functions at The Tampa Bay Hearing & Balance Center. Electronystagmography: 1981 Vestibular evaluative (ENG) services had to be sent out when Dr. Bartels arrived and was only sporadically available. Dr. Bartels initiated the service and hired a technician from Los Angeles to begin the service who is still working at University of South Florida Medical Clinic. ENG services are computerized and enhanced at The Tampa Bay Hearing & Balance Center. Adult Cochlear Implant Services: 1984 Dr. Bartels instituted the first Tampa/St. Petersburg Cochlear Implant Service, only the fourth such service available in Florida. The initially used device was the 3M House device. Secondly, an experimental device was brought in and utilized until the company c eased to manufacture cochlear implant devices. The Nucleus-22 device was brought in and instituted for adults. The program continues at The Tampa Bay Hearing & Balance Center. Pediatric Cochlear Implant Services Dr. Bartels and Mrs. Lisa Fernandez started USF’s pediatric cochlear implant program. The Center did Florida’s first pediatric cochlear implant in 1990. The program continues at The Tampa Bay Hearing & Balance Center. Children’s Cochlear Implant Program: 1989 An experimental program for children was instituted (Fall, 1989), the only one in the State of Florida. Dr. Bartels was the first to do a pediatric cochlear implant on a child in the State of Florida, June 1990. Temporal Bone Dissection Laboratory: Temporal bone dissection for resident education was in place in 1980. However, a well equipped permanent place for dissection was not present. Nine microscopes were acquired with grants, mentioned above. Appropriate drills, middle ear tools, and other equipment were purchased and a laboratory was set up. with the new laboratory in place, Dr. Bartels now gives a full week course in the spring of each year and a short, two-day course each fall. The spring course includes basic as well as clinical sciences lectures for residents. The fall course is basic and prepares materials for medical student education in Gross Anatomy. The laboratory is open for resident study throughout the year. Basic Sciences Laboratory in Vestibulo-cochlear Physiology: 1990 Negotiated with the Dean for a salary line for the purpose of doing basic sciences physiology research. Dr. Bartels chaired a search committee and coordinated the process with the Department of Physiology. The new person, a Ph.D. physiologist, has been selected. This is the first Basic Sciences Laboratory in the Division of Otolaryngology. Dr. Bernd Sokolowski has filled this position and obtained a NIH First Award for 5 years and Deafness Research Foundation funding. Bartels Titanium Bucket Handle Prosthesis for stapes surgery. Designed in conjunction with Grace Medical. US patent pending.